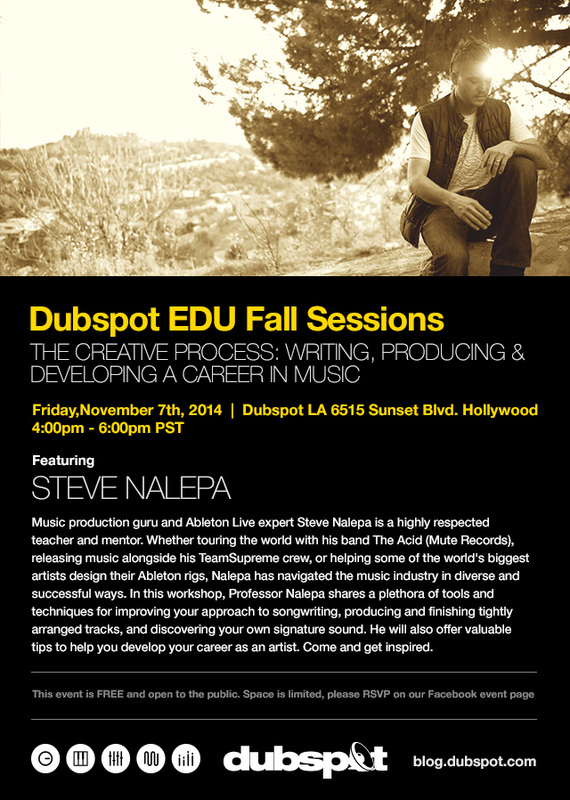 Join music producer and Ableton Live guru Steve Nalepa for a discussion on creating music in Live and growing your career as an artist on Friday, November 7th, 2014 at Dubspot LA. Music production guru and Ableton Live expert Steve Nalepa is a highly respected teacher and mentor. Whether touring the world with his band The Acid (Mute Records), releasing music alongside his Team Supreme crew, or helping some of the world’s biggest artists design their Ableton rigs, Nalepa has navigated the music industry in diverse and successful ways. In this workshop, Professor Nalepa shares a plethora of tools and techniques for improving your approach to songwriting, producing and finishing tightly arranged tracks, and discovering your own signature sound. He will also offer valuable tips to help you develop your career as an artist. Come get inspired. RSVP on Facebook to attend!